The National Chairman of the Peoples Democratic Party, Prince Uche Secondus, has said that the party will retrieve its presidential mandate from President Muhammadu Buhari. He said the mandate was allegedly stolen from the PDP by the Independent National Electoral Commission and handed over to the All Progressives Congress. Secondus stated this when he visited the Governor of Sokoto State, Aminu Tambuwal at the state capital on Tuesday. He said the mandate was freely given to the PDP presidential candidate, Atiku Abubakar, and that none of the states where it is in the lead ahead of the March 23 supplementary election will be hijacked by the APC. He assured Tambuwal that the PDP would win the Saturday’s supplementary election in the state and five other states. A statement in Abuja from the media office of the national chairman of the party said that Secondus said that Nigerians were still behind the PDP. 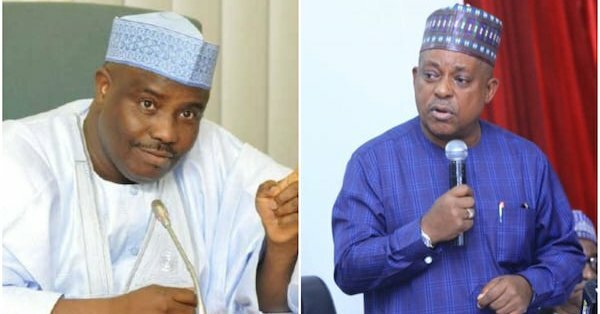 Secondus stated that Nigerians were extremely hurting over the alleged rigging of the presidential and other elections by the APC, as well as the schemes to allegedly forcefully take over states already won by the PDP, leading to the supplementary elections. “Elections are about the will of the people. When you force yourself on the people; that is not democracy. Today, Nigerians are unhappy with the way elections were rigged without allowing the will of the people to prevail”, Secondus said. In his response, Tambuwal said that the PDP and the people of Sokoto State are upbeat and fully mobilized to ensure that their will is not subverted. He said, “We are upbeat as Sokoto State has never been this mobilised. People are praying and fasting by themselves and they are ready once again to ensure that their will is not subverted. “What happened in the last elections was unimaginable as security agents took over the state. Ballot papers were found with APC members on the streets. The staff of the Economic and Financial Crimes Commission stormed the residences of our members, harassing and intimidating them. “Even on the day of the election, they were going round the polling units and picking up our members. There was open rigging in about six of the Local Government Areas. “They brought their federal might to bear but the will of the people prevailed against them and we won, yet they declared the election inconclusive. “So, in Sokoto, they have the will of the people to contend with and given the prayers that our people are offering every day and their decision to checkmate the rigging of APC, victory is sure to be for us and the PDP.” He, therefore, urged all the PDP members and supporters to remain steadfast and march out on March 23 to consolidate on the victory already won by the party in the states where supplementary elections have been scheduled. The National chairman of pdp is saying this with so much confidence. Lets see what the tribunal judgement turns out to be.